The C1 series is the earlier version of the current C2 models. Customers continue to select this model when they want to match with existing assets. Price is marginally cheaper. New heads only can be ordered to replace non-compliant boxes. The pole mount version powerhead is connected by a cast alloy pipe cone straight onto existing 60mm OD water pipe. Pipe cone and socket set grub screws are included in the price. The pedestal version pillars are bolted to a base plate 240mm x 240mm square which must first be bolted to a prepared concrete slab (approximately 500mmx500mm) using four 3/8” dynabolts. For accurate installation Comsen recommends the custom made rag bolt if new concrete is being laid. Additional Power Outlets up to 4. Additional Safety Switches up to 4- circuit breakers (RCD/MCB). New reflective tape option for night time safety. Add up to 2 approved kWh Meters for user pay power. Pole mount version - Aluminum Mounting Pole powder coated. Pedestal version - Add water outlets with up to four chrome taps. Pedestal version - Rag bolt assembly for footing if laying new concrete. Proven watertight with RCBO`s fitted inside the weatherproof, IP44 internationally rated enclosures. Pole Mount – 1570mm on pole, 445mm head and power cord holder. UV stabilised and resistant polycarbonate. 15 amp IP66 Power Outlet. Light filtered downwards through UV stabilised. 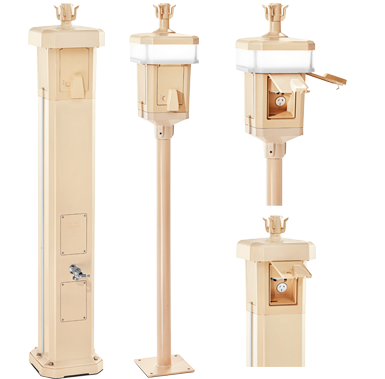 Diffuser providing safety illuminance Diffuser height: add 80 mm to finished pedestal height. Aluminium Pipe 60mm OD 54mm ID Thickness 3mm – powder coated in Paperbark. Pipe Cone connector in cast alloy and powder coated in Paperbark. Pipe Cone – 60mm to 50mm with three socket set grub screws – height 125mm.